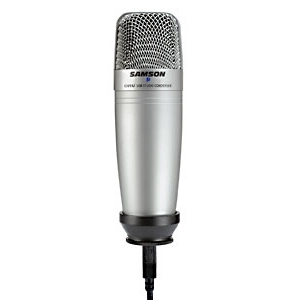 Samson C01U USB Microphone - Tracer Technologies Inc. Need A Tabletop Boom Stand? It?s a must for any musician on the road or in the project studio, but the C01U is going to offer solutions to more than just musicians. The mic opens up possibilities for anyone who records audio?from Podcasters, journalists, students, and business people adding audio files to websites and multimedia presentations. The Samson C01U will work without the SoftPre applet software using the standard drivers included in your computer's operating system. However if you would like added functionality of the Samson SoftPre applet (Input Level Meter, Volume control, High-pass filter and Phase Switch), you may download the appropriate one for your operating system at our SoftPre Page. USB low-power device - draws 26 mA => 130 mW. In suspend mode 0.3 mA => 1.5 mW.